Ray Schrump was born in 1932 in Tomahawk, Wisconsin. He enlisted in the U.S. Army on May 10, 1949 at the age of 17, where he spent nine years as an enlisted man during which time he served in combat during the Korean War. He was severely wounded and spent almost a year recovering from his wounds at a hospital in Japan. He received a commission as a 2d Lt of Infantry in the U.S. Army on April 18, 1958 after attending Officers Candidate School (OCS) at Ft, Benning. 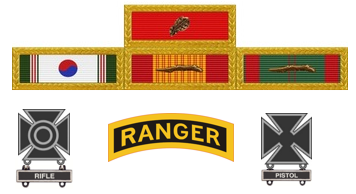 Following OCS, he attended both Ranger and airborne courses. 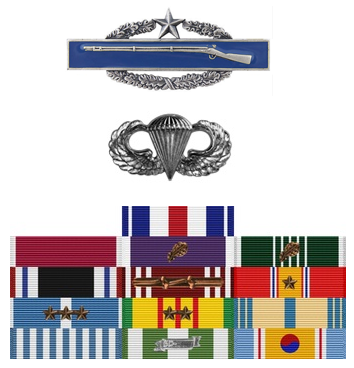 During the next five years he commanded training, rifle and school support companies in the US and overseas before becoming senior instructor of Ground Week of the Airborne School. In 1962, he was promoted to Captain and assigned to the US Special Forces, Fort Bragg, NC where he commanded both A and B Special Forces Detachments with the 1st, 3rd, 5th, 6th and 7th Special Forces Groups. In 1967, after attending Officers Advance Course and Cambodian Language Course, he was promoted to Major and was reassigned to the Military Assistance Command –Vietnam (MACV) as a Senior District Advisor assigned to Tay Ninh Province, South Vietnam. 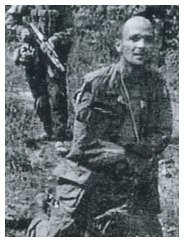 He arrived in Vietnam in January of 1968 and on 23 May 1968 was taken prisoner by the Viet Cong, and after spending 1,727 days in captivity, Maj Schrump was released during Operation Homecoming on February 12, 1973. He was hospitalized for five months to recover from injuries suffered while he was in captivity. Shortly after his release form the hospital, Ray was promoted to Lieutenant Colonel and he retired from the Army on 31 December 1973. Ray’s international assignments include Japan, Korea, Okinawa, Ethiopia and Vietnam. After retirement, Ray owned and operated a small service business in Fayetteville, NC. During the 1970’s, he became very involved in getting an account of personnel still listed as Missing in Action (MIA) from all the wars and spoke at the National Republican Convention on behalf of the POW/MIA’s in 1976. Ray became involved in politics and ran for the Congress in the NC 7th congressional district, but was defeated. Ray has worked internationally as a contractor for 28 years providing support services for US and coalition forces in Egypt, Saudi Arabia, Qatar, Iraq and Afghanistan. 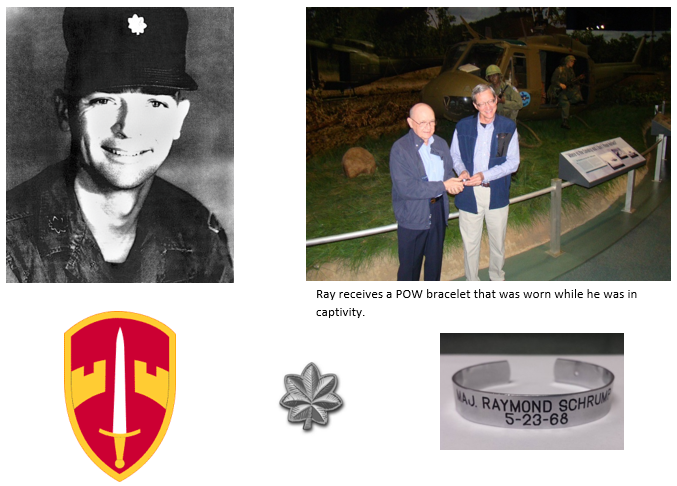 Ray completely retired in February of 2011 after completing a 7 year assignment in Kuwait with the General Dynamics Stryker vehicle. Ray has 2 sons, a daughter, 5 grandchildren and 8 great grandchildren.